About an hour away from Anchorage, you can stop along the Glenn Highway for a history lesson. 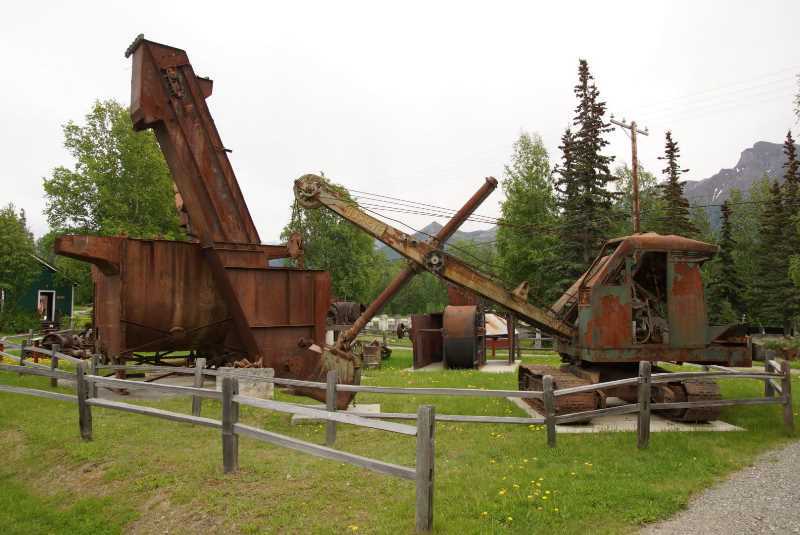 The remnants of a coal washing plant, and numerous pieces of mining equipment, plus a few buildings are on display at the Alpine Historical Park in the community of Sutton. This spot makes a good stretch-your-legs stop for anyone making the long drive down the Glenn Highway. 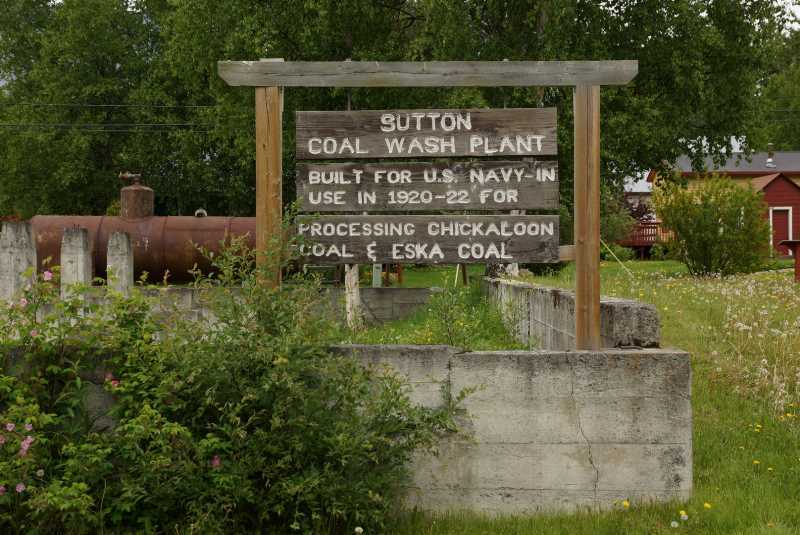 Sutton is located on Alaska 1, the Glenn Highway, at Mile 61.6. The park is located in front of the town’s library. 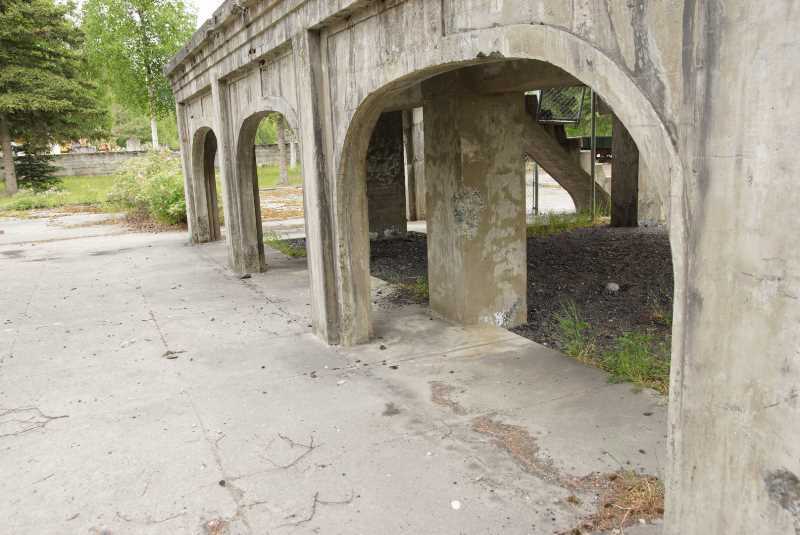 Driving by the Alpine Historical Park, it’s likely the ruins of the old coal wash plant that will catch your eye. 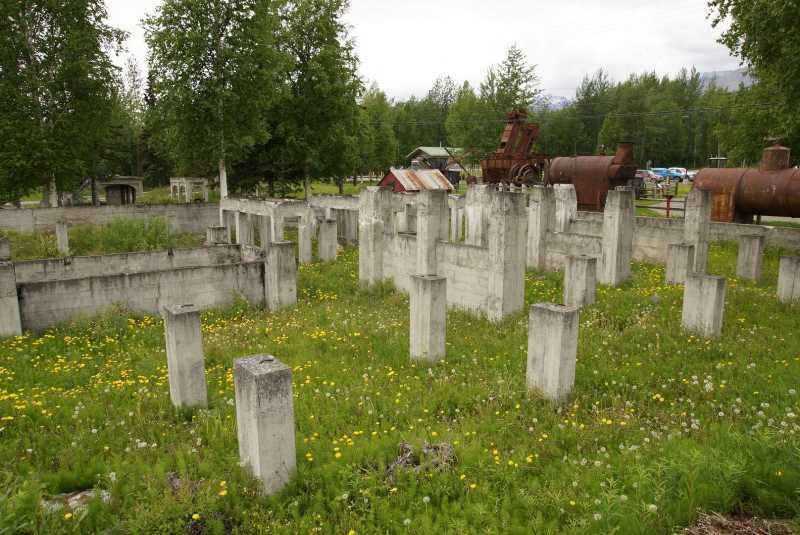 It looks a little bit like a cemetery, but these concrete tombstones are actually the foundation for the coal wash plant, built in 1922. 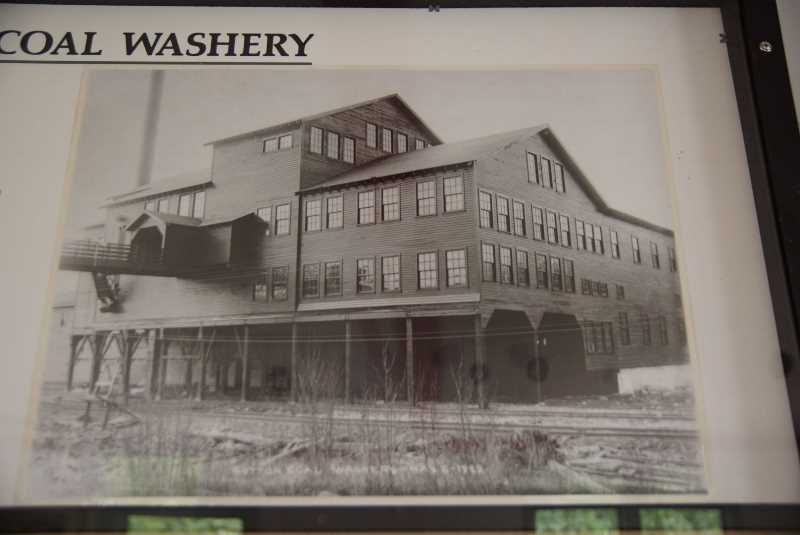 The Coal Washery would process coal from the nearby Chickaloon coal mine. The plant would dump 25 tons of coal per hour into a giant washing machine. Agitators would stir-up the mixture, causing the coal to float to the top, and other rocks to sink to the bottom. The clean coal could then be dried and shipped out. … and some parts of the foundation are still recognizable today. Nearby, you can walk around exhibits of coal processing equipment. That big machine on the left is a coal washing machine. Two boilers are also in display. The one in the foreground was made in Pennsylvania, the one behind it was made in Illinois — so both of them made a very long trip up here. 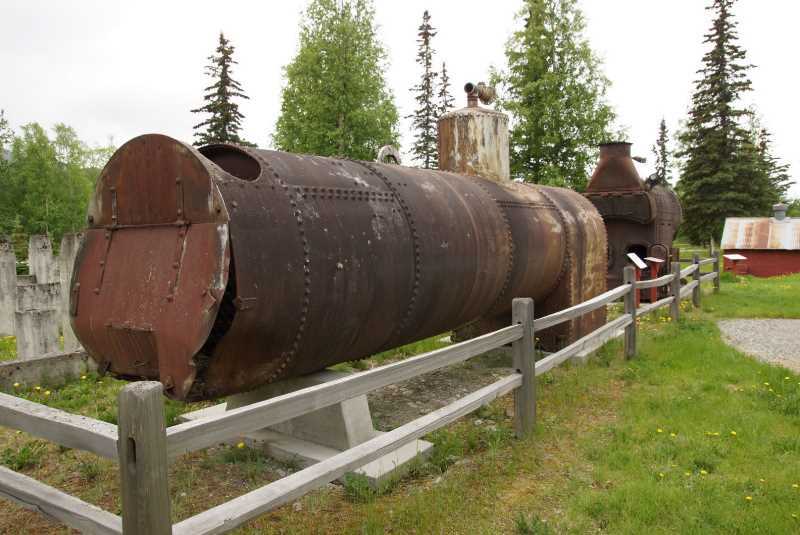 The boilers would burn coal to boil water and create steam. Be sure to check out these two houses. 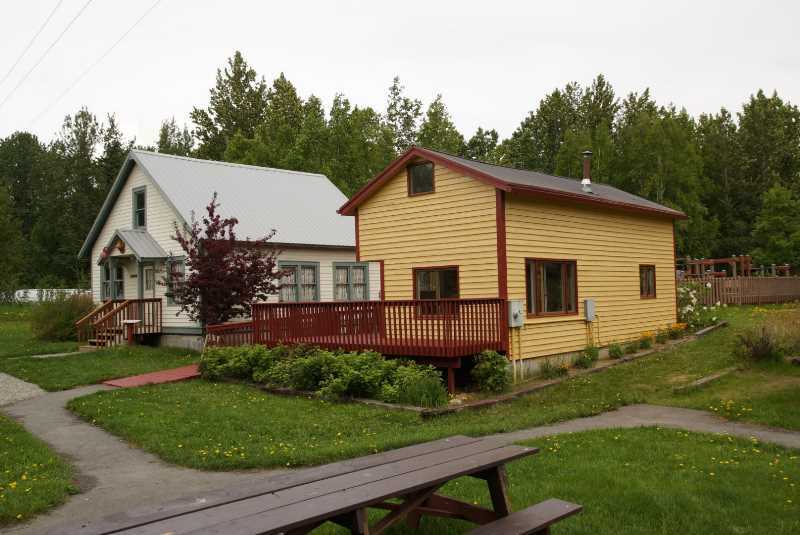 The one on the left is the Lucas House, built in 1917 as a residence for workers at the Chickaloon mine. It was moved to Palmer in 1943, and then eventually here. The house on the right (I think) is Mary Geist House, which was first built as a guest house in the 1960’s, and now houses the Old Timers’ Hall of Fame, honoring residents of Sutton. 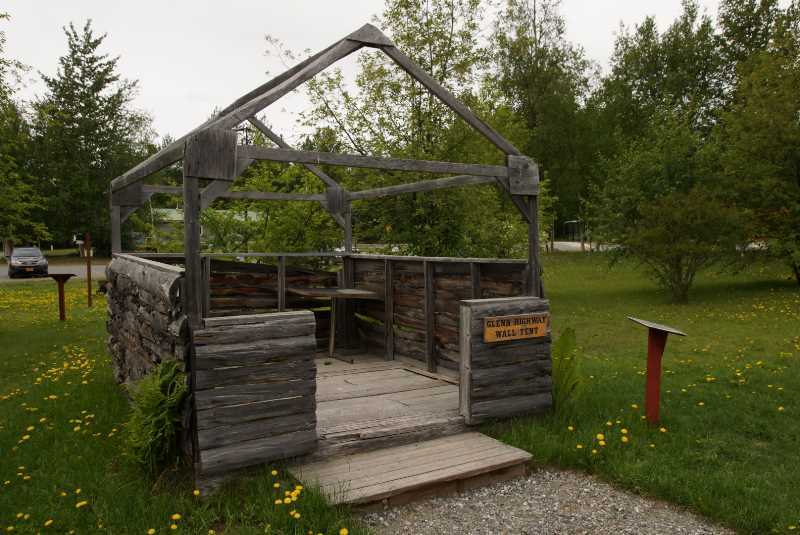 There’s also an example of a “wall tent” – a semi-permanent structure that was easy to build, to provide housing for miners. Once you’ve experienced the area’s history, hop back on the Glenn Highway for the drive into Anchorage, or east towards the Matanuska Glacier and the often-photographed Lion’s Head, which is only about 45 miles away.